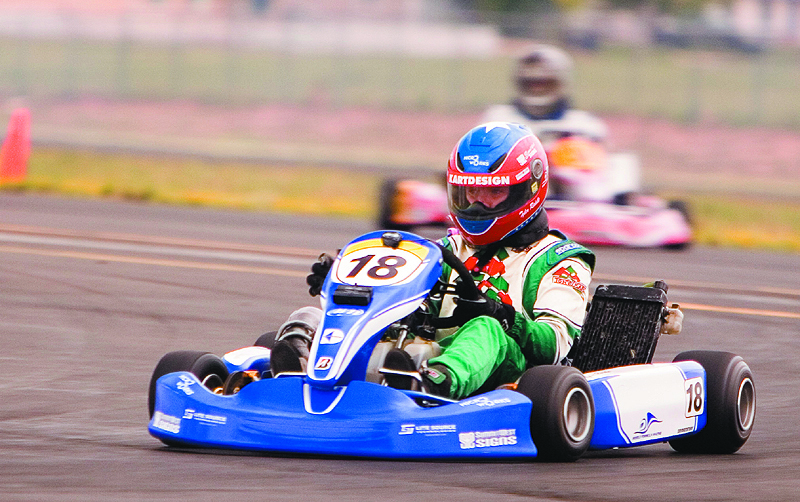 Yesterday was our first day to take out Tyler’s new 125cc Shifter kart to give it a run. While the picture “seems” to make the new kart look bigger then the old kart it is not. The bodywork and chassis are the same size. The double-decker stand that the new kart is on is just taller and closer to the camera. The old chassis with the 80cc shifter engine on it is blue so Tyler decided he wanted the bodywork to mimic the Williams F1 team colors. The new kart has a purple frame so we had to find a color combination that would not “clash” with the purple and yet be acceptable. We decided to mimic the Crown Royal Grand-Am prototype car. Sam at SummitWest did a great job. Saturday saw the schedule calling for two practice sessions. One in the morning and another in the afternoon. Set up our space. Made a few adjustments to the kart I was waiting to do once we got up to the cooler mountain climes of St. Johns (better then doing it in the hot garage down in Mesa). Tyler went out for the first practice session on his 80cc shifter and came back in on the very first lap. No brakes and the kart was pulling really bad to the right on the straights. On a track like St. Johns brakes are very important considering that it has two downhill straights (1/4 mile and a 1/2 mile long that end in 90 degree left hand turns) and an uphill 1/4 straight that has a greater then 90 degree right hand turn. In short section of track at the top end of the hill with five quick fast turns.